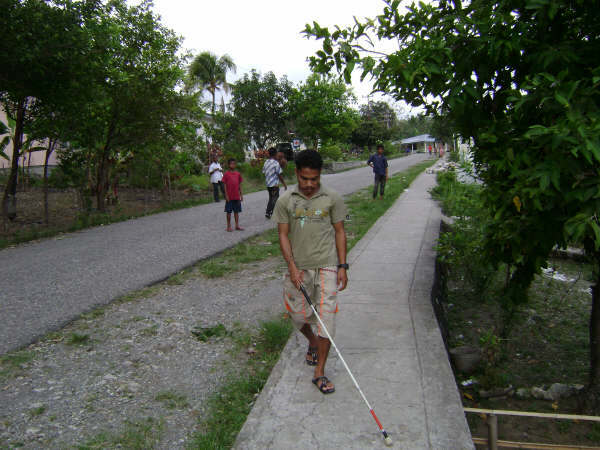 In 2009 The Grub Club undertook fund raising to help the Fuan Nabilan School for the Blind in Same, Timor Leste. The school comprises of eight students plus their teachers and is housed in a small building which includes residential quarters for the students near the hospital in Same. Same is a small town. The community is generally quite poor, with limited means of income and employment available for the unskilled workforce. The project that was undertaken was designed to improve the sanitation, hygiene and functionality of the current residential school facilities. The two main inclusions were a completely new toilet (with a new septic tank) and an enclosed kitchen. There is also a small section of concrete paving that will also be constructed in order to make the surface immediately adjacent to the school more navigatable for the blind students. This is important support to visually impaired children through improved sanitation, hygiene and safety. The current toilet and its seepage problems has been causing mould and mildew problems for the children in their adjacent bedrooms. There is no real kitchen area and the space that is used is not secure. The project will provide a new working toilet (and septic tank); a more safe and hygienic kitchen which will be more functional for the blind children; and a paved area that will remove trip hazards for the blind students that are immediately adjacent to the school building. The work was carried out through local contractors under the direction of Life, Love and Health. The Grub Club was able to contribute $4500 to this project.